Pioneer of rafting in Bali ! 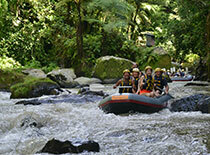 Activity Bali Adventure has more than 20 years achievements to Rafting as Bali's first rafting operator company. 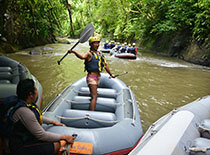 Except Rafting, Bali Adventure operating many activities such as Kayaking, Cycling, Trekking, and Elephant Park. 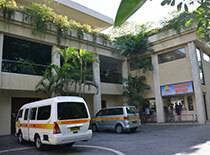 It is one of biggest activity company in Bali equally matched Sobek. ◆ Renewal open in 2011! All equipment is new! Arrive at Check in counter. 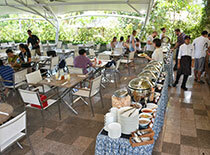 ・After check in, change your cloth and wear safety equipment such as Life Jacket or Helmet. ・Divided into the group each of same boat and introduce your guide. ・Put the valuables such as a camera or the wallet in a waterproofing bag and take it to departure point each person. ・Go to the bank of Ayung river with your guide. Go down about 400 steps stairs. ・The explain of instructions by English. ・Leave a waterproofing bag and your shoes with a guide. ・After practice to grasp oar or sign, rafting start. ※Bali Adventure rafting play by a bare foot. Pass the magnificent relief on rock wall. Although you can take a photograph here. Take a break at the bank of near waterfall. It can become big waterfall when it rained. During break, Bali Adventure's cameraman will take a memorial photo. If you want you can perchase at the finish point. Arrival at finish point at Ayung river. ・Return your life jacket, helmet and oar. ・Go up the 200 steps stairs and arrive Check out Point. ・Receive a towel and baggage. You can available Changing room, Hot shower, and Rest room. If you want to borrow Shompoo or Body Soap, please inform staff. 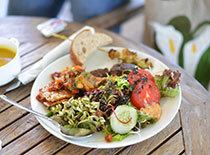 ・Enjoy a sumptuous lunch at the nice view restaurant. Although it prepared few kind of Desser or Fruit. ・You can perchase memorial photo or DVD. ※Those schedule might change by traffic condition. Maximum Low Price is Available! Master menu of 3 activity! 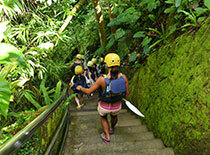 5 starts activity company among in Bali There are plenty of rafting equipment Clim up 450 steps after rafting. The rafting boat is really strong. Ayung river is gentle and mellow river so wide range of age people can enjoy. It will be bit thrilling when the plenty water in river. Can 1 person customer join? 1 person customer can join depend on booking condition. Please contact us. How long the time from leave the hotel to returning? Morning tour takes about 6-7 hours, Afternoon tour takes about 5-6 hours. What kind of shoes recommended? 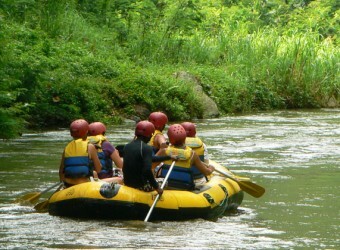 For Bali Adventure, Rafting play by a bare foot so you can wear any shoes. But you have to go down and up stairs so we recommend easy walking shoes. Could I take my camera or video? Yes. 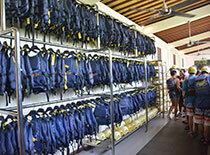 Bali Adventure prepare a waterproofing pack for each guest. But, because for safety Rafting, our guide will keep waterproofing bag darling Rafting.In addition, compensation of an accouterments are not included insurance. Please be careful. Could I take photograph during of rafting? Yes, you can take a picture near relief or waterfall. 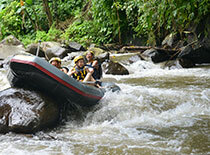 In addition, you can purchase the photograph which took by Bali Adventure during Rafting. Can the guide speak English? Yes. All guide can speak English. Is there the something limit for participation? From 5 years to 65 years health person can participation. Combine car will around the Hotel each area. Pick up time may change depending on the weather condition or number of reserve people. Indonesian buffet. Include Coffee, Tea, Fruit and Desserts. ※Above charge and schedule possible change without a previous announcement. ※Your personal effects are not include insurance. It was my first rafting experience. At first I was anxious, but I felt relieved when I got a very polite explanation and service. It’s the first experience for river activities, and quite different to sea activities. There are 2 rivers in Bali and I also want to join rafting on another river. Although the price is high it doesn’t matter, because it was a great experience. It became a really fun and great memories.